Purposeful Pints at Copper Trail Brewing Co. 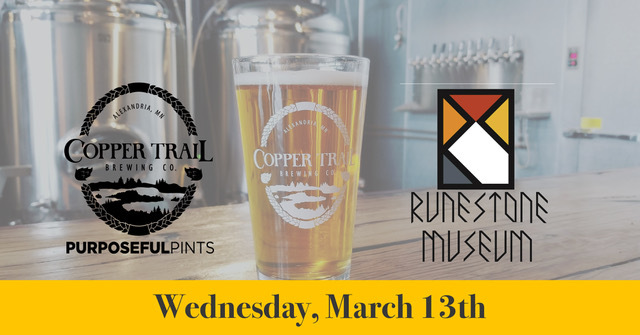 The Runestone Museum Foundation will be hosting Purposeful Pint night at Copper Trail Brewing Company! $1 of each beer sold during the night from 3 p.m. – 9 p.m. will be donated to the hosting non-profit! Come out to see what this organization is all about and how you can help give back to the Runestone Museum Foundation. We will have an information table set up as well as some of our newest gift shop items available for sale at Copper Trail!